Nigerian Ports Authority (NPA) would make adequate provision in the 2018 budget to meet some of the urgent requirements and needs of the University of Lagos Community under its Corporate Social Responsibility (CSR) initiative. 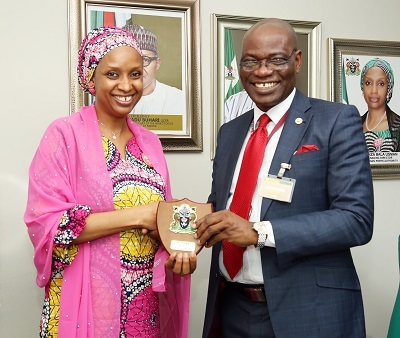 The Managing Director, NPA, Hadiza Bala Usman, who gave this assurance said the University of Lagos deserve to be assisted in the CSR initiative considering the deplorable condition of its amenities and as one of the premier universities in the country. The Managing Director of the Nigerian Ports Authority (NPA), Hadiza Bala Usman (6th from left), the Vice Chancellor of the University of Lagos (UNILAG), Prof. Oluwatoyin Ogundipe (7th form left), NPA Executive Director, Engineering & Technical Services, Prof. Idris Abubakar (5th from left) and other Stakeholders, when the Executive Management of UNILAG paid a courtesy call on the MD at the NPA Corporate Headquarters in Marina, Lagos. The Managing Director pointed out that the Authority is desirous of collaborating with the University in the areas or capacity building for the organization workforce.